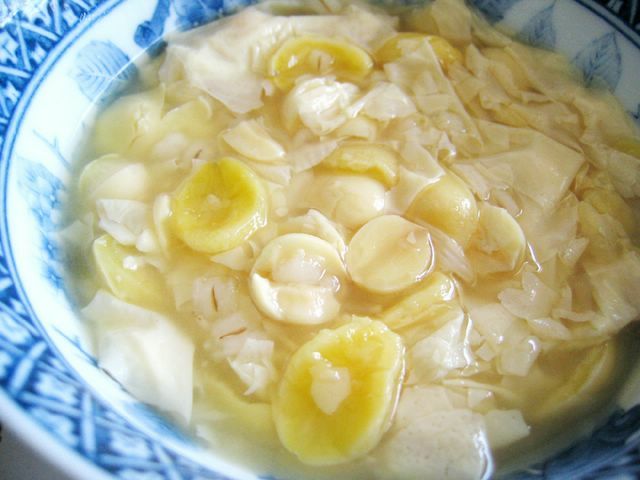 This is one of my favourite oriental dessert and there’s nothing better than a bowl of it that’s homemade. The ones I have outside are either too sweet or really stingy with the ingredients. This dessert is known to be really good for your skin – the gingko and beancurd skin attributes to that I think. It also contains lotus and barley seeds. Perhaps I should make it myself someday. Anyhow, this dessert is a definite must-try, though I think most people don’t really like the gingko (the yellow fruit). I remember having difficulty even swallowing it when I was younger… I didn’t like it at all, and preferred having more lotus seeds than gingko. But now, I love it! Besides it’s good for my skin! I’m not familar with the ginko fruit, Is this something you only can get there? A little note about gingko nuts: it’s poisonous to eat more than 9 nuts in a day. Again, this is according to a China tour guide and one of my friends. don’t know how true is that…. docile: yea… i love it too; it just slips down your throat! novice baker: is it really? I think it’s the outer layer that’s poisonous… but anyhow i don’t eat it that often, so i guess it’s okay. haha. Nani: ahh cheng tng! haven’t had one for so long! Oooo island creamery rocks la. ohh if you happen to be at marine parade, check out Scoopz at the Basement.. it’s just beside MPH. They have the best durian ice-cream! all homemade! and i like their new grape flavour. you can see and taste the bits of grapes ya know. it’s not too sweet too..
i Makan: yea cooling for such a hot weather that singapore is having now! Been wanting to try cooking this again for a looonnng long time. The last time I tried it din turn out well 🙁 …perhaps it was the beancurd skin I used.